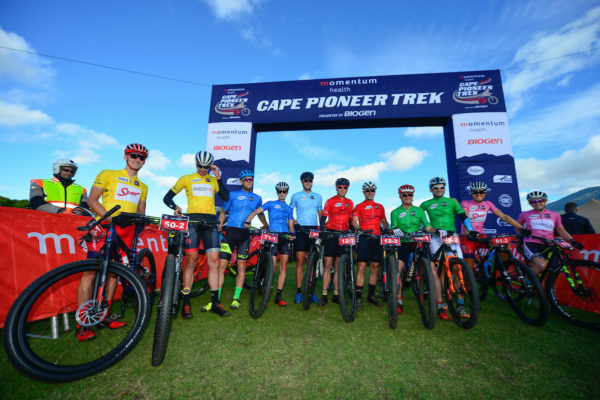 The various category leaders pose for a photo before the start of stage 6 of the 2017 Momentum Health Cape Pioneer Trek, presented by Biogen. From left to right: Alan Hatherly & Matt Beers (UCI Men), Charles McFall & Carmen Buchacher (Mixed), Tiaan Swart (Solo Men), William Wertheim-Aymes & Deon Kruger (Masters Men), Fanie Venter & Friedrich Max (Veteran Men) and Ariane Luthi and Amy-Beth McDougall (UCI Women). Photo by Zoon Cronje. Despite both the men’s and the women’s races featuring an early break – during stage 5 of the 2017 Momentum Health Cape Pioneer Trek, presented by Biogen, on Thursday the 19th of October – the stage was decided by mere seconds. 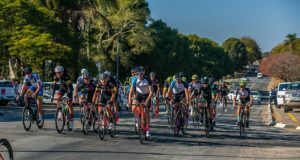 Team Spur/Red-E secured their second victory in a sprint finish, by out-muscling KMC Fruit to Go and NAD Pro MTB, while Team Ascendis Health edged out Team Spur/Valencia by eight seconds at the end of the 97 kilometre long stage. 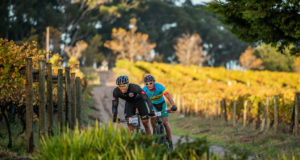 The fifth stage of the race was second longest and the last journey stage of the event, as the route wound its way from the forests of George to the arid Klein Karoo of Oudtshoorn, via the hop plantations of Herold. The day featured 1 650 metres of altitude gain, most of which came in the first twenty kilometres on the storied Montagu Pass. Nico Bell and Gawie Combrink, of NAD Pro MTB, set the pace up the pass and forced a split which only Team Spur/Red-E could follow. “Nico [Bell] and Gawie [Combrink] must have slept well last night because they went hard from the end of the neutral zone” Hatherly commented. The leading two teams opened up a gap of 90 seconds by the first water point at the 35 kilometre mark but then a headwind neutralised the race. “We wanted to make it as hard as possible to test Spur/Red-E, but when we got over the pass and into the head wind we realised it was pointless killing ourselves into the wind, while they could just sit in our slip. So we rode tempo until the other guys [KMC Fruit to Go, SPOT Africa, Kelly’s Bikeranch and KTM Pro Team] caught us” Bell explained. The KMC Fruit to Go team, of Bram Rood and Gerben Mos, had their strongest stage of the race so far – fighting back to the lead group of NAD Pro and Spur/Red-E on at least three occasions. “We rode our own pace up the climb and then worked with KTM and two solo riders to catch NAD and Spur” Rood said. “We were riding to defend our third position so when the other teams dropped off in Chandelier [Game Reserve] we were not worried when we could not keep up with NAD and Spur anymore. But then coming towards the tar we caught them and we rode into town together. When we turned down towards the river I crashed with 2 kilometres to go, so we went full gas and caught them again with less than a kilometre to go. There was a really narrow gate at the start of the finishing straight and we managed to get through there ahead of NAD so that’s how we beat them in the sprint” Rood elaborated. The Dutch team were no match for Team Spur/Red-E however. Hatherly once again powered away and sat up over the finish line to see if Beers could complete the stage win for the team. Though Rood and Combrink both beat the Red-E rider across the line, he easily outsprinted Bell and Mos to secure a fifth stage win for his team. “In the sprint it is just my job to keep Alan [Hatherly] in sight” Beers said, simplifying the situation. The three way sprint provided the closest finish of the 2017 Cape Pioneer Trek thus far. Hatherly and Beers took the stage win by a single second over Rood and Mos who edged out Bell and Combrink by three tenths of a second. The women’s race also featured an early break with Robyn de Groot and Sabine Spitz, of Team Ascendis Health going on a solo attack on the Montagu Pass. Amy-Beth McDougall looked to be in trouble early on but Ariane Lüthi kept her composure and the pink jersey wearers limited their time loss to 1 minute and 12 seconds inside the first 20 kilometres. “Ariane [Lüthi] was brilliant, she helped me so much today” McDougall said after the stage. “We established a good gap early on, but once we got onto the district road through Herold and Paardepoort we hit a head wind. Ariane [Lüthi] and Amy [McDougall] were in a bigger group and they managed to catch us before the second water point. From there we rode together until the final few kilometres were we got a little gap on a singletrack” De Groot explained. The Ascendis Health combination eventually crossed the finish line 8 seconds ahead of Team Spur/Valencia with the Junto Ladies team, of Nicola Giliomee and Frankie du Toit, finishing 28 minutes and 59 seconds back in third. The general classification gap between Ascendis and Spur/Valencia now stands at 5 minutes and 8 seconds. With the brutal Queen Stage and deceptively tricky Grand Finale left to race that buffer is anything but secure. The 2 700 metres of altitude gain on the schedule for Friday’s stage 6 will provide Ascendis Health and NAD Pro MTB with the best opportunities of the race to surpass the Team Spur men’s and women’s teams, who have held the race lead since the opening stage on Sunday. To follow the action as it unfolds mountain biking fans can follow the event’s Twitter handle, @CapePioneerTrek, from 07:30 on Friday morning. In addition to the live coverage on Twitter the highlights from every stage of the race can be viewed on the Cape Pioneer Trek Facebook page and the Dryland Event Management YouTube Channel from 20:00, Central African Time, daily. For more information on the Momentum Health Cape Pioneer Trek, presented by Biogen, please visit www.capepioneer.co.za. For all the results from the 2017 Momentum Health Cape Pioneer Trek, presented by Biogen please click here.